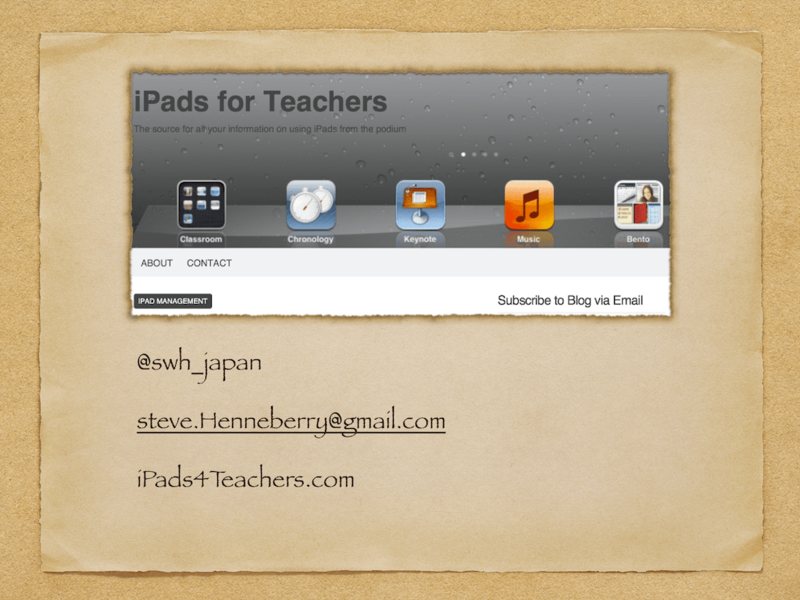 The presenters will discuss practical ways that iPads, Apple TV, and pocket WiFi connections can be implemented in the classroom. This forum will be useful for teachers at jr/sr high school and university levels. AJET (the Association for Japan Exchange and Teaching) is the sole representative body for over 4,500 teachers in the JET program, all across Japan. Matthew Cook was the 2011-2012 Chairman of AJET’s national council, which conducted an unprecedented survey on use of technology in public schools all across Japan. Hear about results of that survey, the reported implications regarding technology use in public schools, and how that information is used to counter a system lacking technological solutions. A short Q & A will be held at the end, and you will also learn of ways that you can help improve the use of technology by JETs around the country. This was written by Stephen W. Henneberry. Posted on Sunday, June 3, 2012, at 2:50 pm. Filed under Panel Discussions, Presentations. Tagged Assessment, iPads, video. Bookmark the permalink. Follow comments here with the RSS feed. Both comments and trackbacks are currently closed.